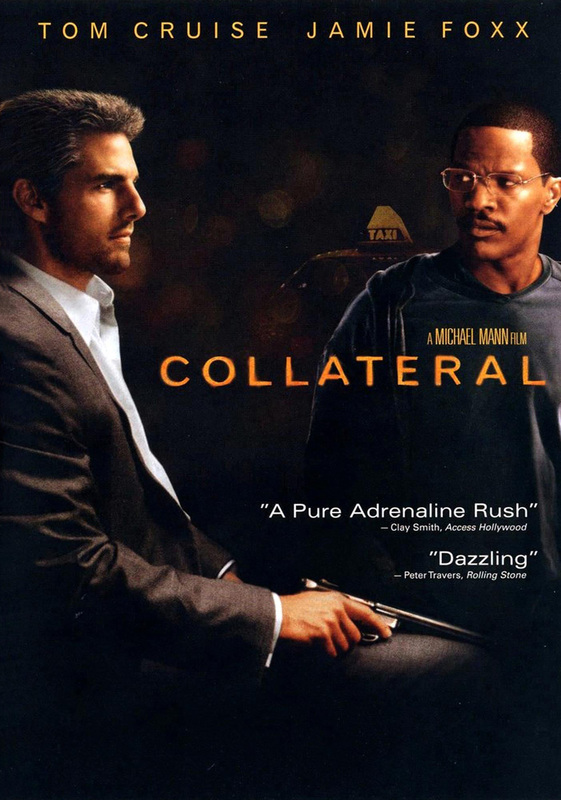 Collateral is a dysfunctional take on a dysfunctional sub-genre. It is a buddy movie in which our mismatched duo, brought together and torn apart by fateful events, careen towards an unwilling confrontation that melds unlikely compassion with big city detachment in a way that befits the movie’s overall theme. 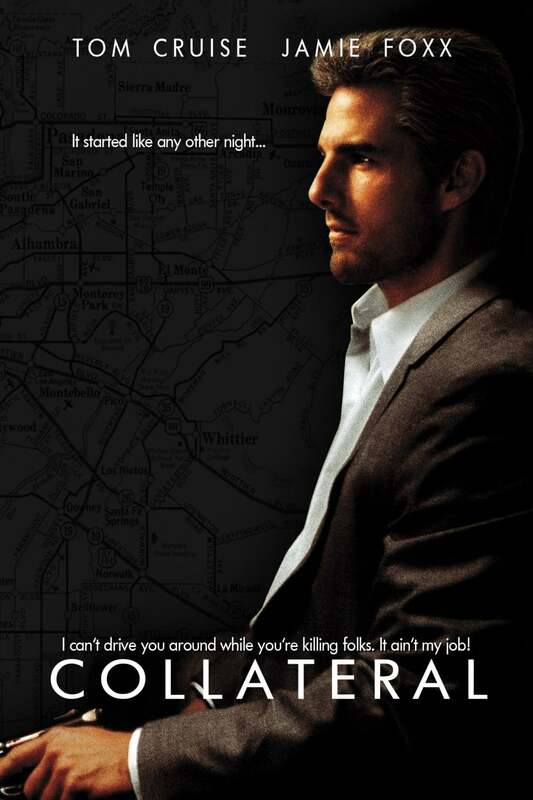 Early in the film, Vincent (Tom Cruise) arrives in L.A. for undisclosed reasons, and after taking a cab talks candidly to the driver about his distaste for the city and its apparent disconnection from human understanding. He tells the story of a man who died on a subway train, only to remain undetected by his fellow passengers for hours on end. Moments later, after charming cabbie Max (Jamie Foxx) into a contracted fare, he kills the first of many targets in cold blood before calmly emerging from the building and routinely handling the physical and emotional mess his murder results in. Vincent – [about liking L.A.] No. Tell you the truth, whenever I’m here I can’t wait to leave. It’s too sprawled out, disconnected. You know? That’s me. It is clear from the very offset that Vincent is something of a contradiction, and you have to believe that his erratic behaviour is a mechanism for maintaining control over the situation. This is a man who flips between murder and empathy with an insouciance that defies reason, but in his skewed logic and misplaced philosophies he is able to come across as relatable, his actions strangely justifiable. When Max freaks out upon realising the reality of his situation, Vincent is somehow able to put things into perspective. After all, why care about the demise of one bad guy when thousands of innocents die in Rwanda every day? A spurious justification for murder, but a relevant one, and a stark reminder of the hypocrisy of the human condition. Vincent is a different breed of antihero in the sense that we can never quite figure him out. His act is not filtered by subtlety. We are not fooled as we are with a character like James Gandolfini’s Tony Soprano. His contradictions are immediately obvious, are in fact flagrant, and he seems at peace with his decisions and the socially undesirable role he inhabits. A spiritual, passionate, empathetic assassin, he is the personification of pretentiousness, an advocate for the modern, disconnected society he so openly decries. Whether this duality is a conscious effort on his part never really becomes clear, and in the end it really doesn’t matter. Vincent is a meticulous, emotional chameleon whose personality is dictated to by a singular goal. Vincent – Did you join Amnesty International, Oxfam, Save the Whales, Greenpeace, or something? No. I off one fat Angelino and you throw a hissy fit. This kind of detachment is typical of director Michael Mann, who in the much superior Heat painted a portrait of two moral opposites plunged into a world of emotional disengagement, and here he shoots the city of Los Angeles in much the same way, drenching the streets in neon while immersing us in devastatingly aloof birds-eye shots of a billion-footed beast of frenetic and ceaseless action. There are other Mann hallmarks which hammer the point home in terms of composition – the unsettling framing of the film’s characters and intimate, almost claustrophobic close-ups that meld from one subject to the next – but in Collateral the director seems to go one step further, reducing an entire narrative strand to a pawn in his game of large-scale anonymity. Like most crime thrillers, we follow the exploits of two cops who inevitably become embroiled in events, but unlike the vast majority of those movies, theirs is a peripheral involvement which takes up a third of the film’s running time without having any real tangible impact on proceedings. Fanning and Weidner — I’ll bet those names were absent from your memory — are on the punitive trail as a series of related witnesses fall thick and fast. The pair seem tired and lethargic, singed of all emotion as they track the usual cast of morbid victims. The two are so anonymous and lacking in motivation or backstory that they saunter through the movie like shadows on the neon drenched fringes. Their roles as protagonists are never truly delineated. They are simply two spectators in the city’s marauding parade, and when Fanning is abruptly disposed of in the second act his demise is of little consequence. He and Weidner appear to have no discernible human connection. Fanning: Sure… he’s depressed so he jumps four stories out of a window onto his head. “Wow, that feels better.” Picks himself up. “Now I think I’ll go on with the rest of my day”. The only authentic bond that exists in the movie is that of Max and Annie (Jada Pinkett Smith), who in the ultimate irony are fated by an unlikely contrivance. Characters cross with happenstance on several occasions — Annie and Vincent on parallel escalators, Vincent, Max and Fanning in a hospital elevator — but Max and Annies’ is the only relationship which doesn’t act as a reminder that in the modern, sprawling metropolis, people are everywhere and nowhere. Still, the two are not exempt from the city’s alienating nature. Max is a lonely momma’s boy with fading dreams of success, and Annie is a high-flying professional hiding behind a mask of inhuman strength, the kind of person who immerses herself in isolated, late-night workloads as a way to escape the reality of her existence. In the end, it is a shared predicament that brings the two of them together, the defence mechanisms they have created manifesting in different personalities of a complimentary nature. The only other relationship that shows any hint of a human connection is that of our two central characters, and though there seem to be moments of genuine understanding between Max and Vincent, it is more a relationship of co-dependency that either would destroy given the right motivations. As soon as the two of them begin their ill-fated journey, we are faced with the question: why would a hitman expose himself to a witness by employing him as a chauffeur? This question only grows in pertinence when Vincent’s first victim falls from a five-storey building through the windshield of his driver’s car, and instead of simply adding Max to his kill list the shooter takes him as an ongoing hostage and aid, helping Max with a spurious legal pickle concerning his exploitative boss and even taking time to visit his mother in hospital. Does Vincent, a man who clearly has very little understanding of the reality of human relationships, actually like Max? If his ravings about the tragedy of human disengagement hold any semblance of truth, then perhaps the good-natured Max is the antithesis of his skewed perceptions, the one soul in his life who is actually worthy of being spared. 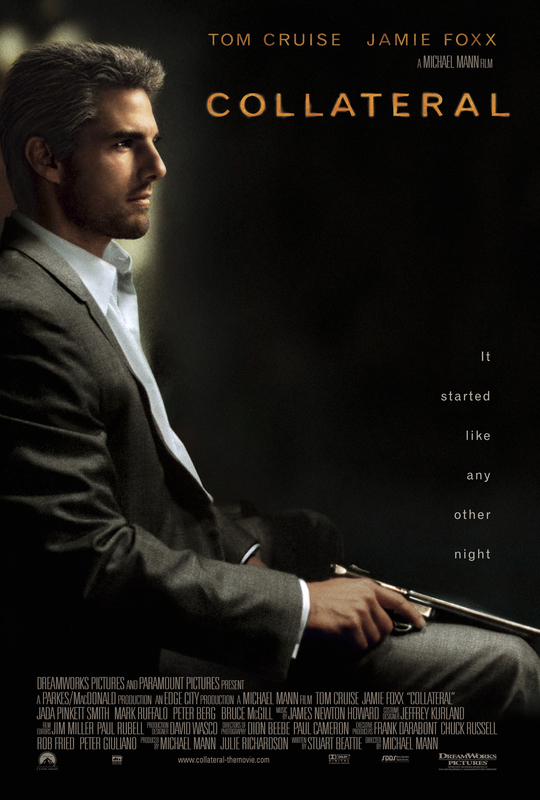 Vincent is no doubt using Max, particularly during a scene in which the two of them go for a seemingly innocent drink together in a city jazz bar, only for Max to become an unknowing pawn in an assassin’s game, and perhaps Vincent had planned to kill his accessory when the job was done, even if he does save his life during a shootout inside a nightclub. Much like our assassin’s behaviour, the movie’s central relationship is full of contradictions, and is effective in both conveying the movie’s primary theme and creating enough uncertainty to maintain the kind of surging tension Mann is renown for. 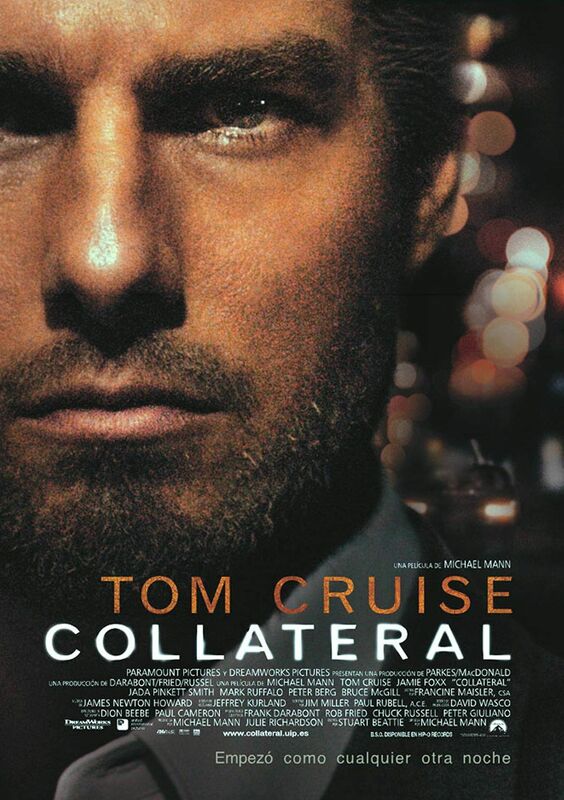 Collateral may not be as nuanced as Heat, and in fact treads familiar ground in a more diluted way, but this is filmmaking of the highest order from a true master of the craft, and a testament to one of Hollywood’s most dynamic visionaries.